With stocks starting to look a little tired and the indices overbought and bumping into key resistance, the bears suggest things are looking a little "toppy" here. Of course, this is a fairly common battle cry from the glass-is-half-empty camp as they rarely see a reason for stocks to move higher. Even the most ardent bull will likely agree that the bulls could probably use a rest at some point soon as stock prices have run an awfully long way in a very short period of time. And since stocks don't usually move in a straight line for long, it wouldn't be surprising to see a pullback develop and for support to be tested. However, from a bigger picture perspective, the key question is if the current joyride to the upside represents the start of a new bull market - or - merely another trip through the now expanded trading range that has been with us for the better part of 18 months. Whenever I'm confronted with such a dilemma, I like to remove emotion, check my ego at the door and run through the key indicator panels. Well, to be honest, I actually run through this exercise on a weekly basis and review most of the trend and momentum indicators each and every day. We always start with price since as an indicator, price cannot deviate from itself. In other words, it is what it is. As you can see from the prevailing color of this panel, the trend of the stock market remains positive. However, we will note that the longer-term trend model (which is basically the "death cross" indicator) continues to be negative and the cycle composite is neutral over the coming week. Next, let's look at the momentum indicators to see if there is any "oomph" behind the move. With the exception of the long-term volume relationship model, which has been negative for quite some time, the rest of this panel looks pretty good. We will also note that stocks have enjoyed several "breadth thrusts" over the last month and a half, which traditionally has been a good omen for the coming 3, 6, and 12-month time periods. In addition, note that the historical return average of this model set is well above the mean seen since 1900, which stands at around 9.9%. Next up is the "early warning" set, which is designed to indicate when traders may start to "go the other way" for a trade. One glance at this group of indicators tells the whole story from a short-term perspective. 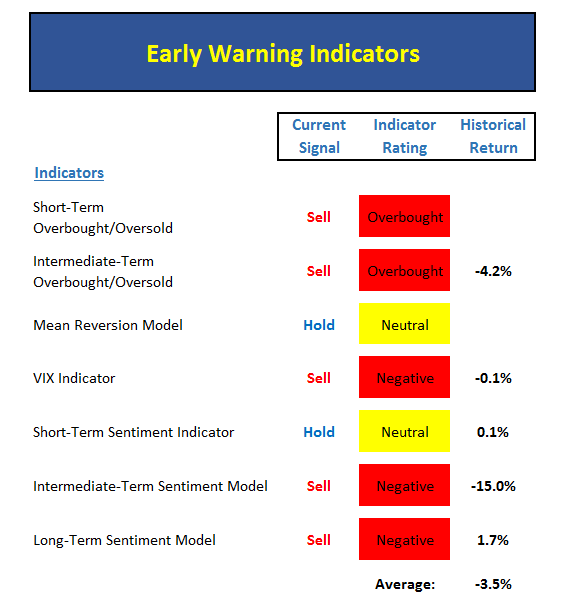 Stocks are overbought, sentiment is largely negative, and the VIX indicator is waving a warning flag. In short, this panel says things are ripe for a reversal of some sort. Now let's move on to the market's "external factors" - the indicators designed to tell us the state of the big-picuture market drivers including monetary conditions, the economy, inflation, and valuations. To summarize this panel, monetary conditions are moderately positive due to rates remaining extremely low, the economy model is moderately positive, the inflation model has improved recently, and valuations are a wash. Finally, let's turn to our favorite big-picture market models, which are designed to tell us which team is in control of the prevailing major trend. The good news here is that there is no red to be found on this indicator set. 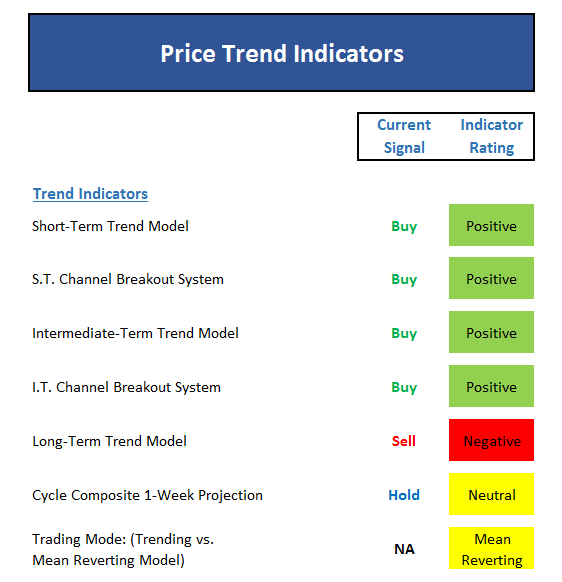 While the "leading indicators" model is currently neutral, it should be noted that the model recently gave a long-term buy signal. And given that this model did a fine job of issuing a warning on May 19, 2015, this is something worth paying attention to. 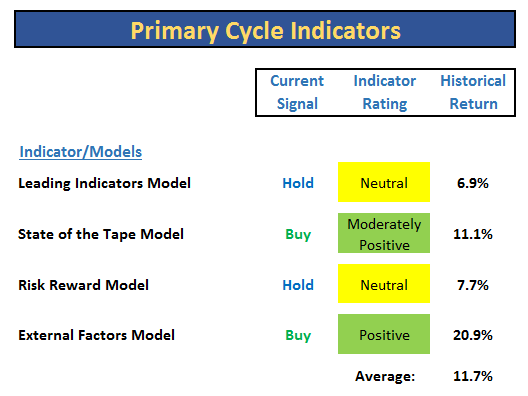 In addition, our "state of the tape" model (aka my "desert island indicator") has also improved recently. And while this model has been whipped around a bit by the veracity of both the correction/rebound cycle seen since last August, this remains one of the best indicators of the market's health available to us. Unfortunately, the "risk/reward" model has refused to sing a positive song and remains no better than neutral. However, as you can see from the historical return reading, stocks can advance with the model in the neutral mode. 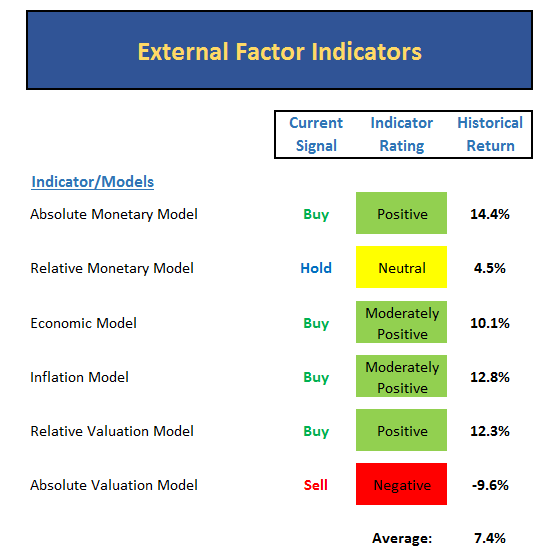 And finally, there is the "external factors" model, which is a single model summary of monetary, sentiment, valuation and economic indicators. However, unlike our "external factors" panel above, the valuation model focuses on valuations relative to interest rates, which remains positive. As such, this model set is fairly positive. 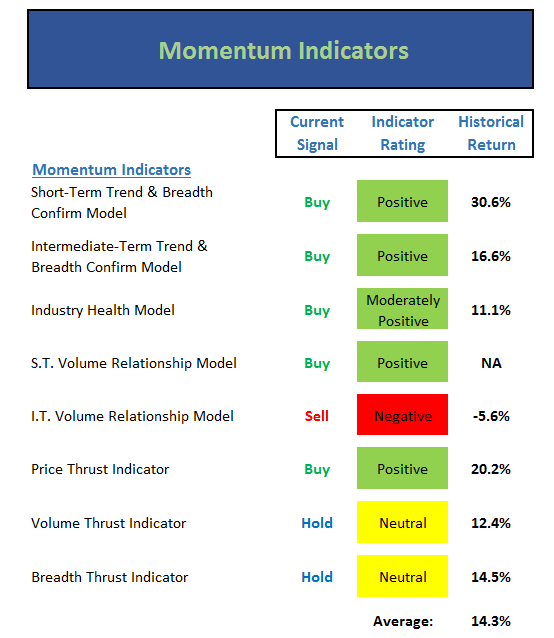 To sum up, our trend and momentum indicators are positive on balance and suggests we should lean bullish here, despite the fact that the early warning models are saying a pullback is very likely in the near-term. And with both the external factor and primary cycle panels looking fairly positive, the bottom line is the weight of the evidence is bullish at this stage. So, while this is not an all-systems-go environment, longer-term investors should be siding with the bulls and implementing a buy-the-dip approach at this time. Modern times demand modern portfolios! Learn More about using MPD™ to modernize your portfolio! Do you really want Robots in charge of your portfolio?